The Slovakian Wirehaired Pointer is a all-around gundog, not just a pointer. It is capable of pointing, trailing game, flushing and retrieving from both land and water. They are primarily used to hunt small animals such as birds and hare, but it is capable of hunting larger prey like deer. 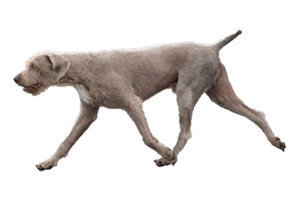 A more recent breed, the Slovakian Wirehaired Pointer was developed in the 1950s from a cross of Cesky Fousek and German Wirehaired Pointer whose offspring was then mated with the Weimaraner. Today they remain a rare breed and kept almost exclusively in their homeland. Is the Slovakian Wirehaired Pointer Right for You?